Jaromir Jagr was born on the 15th February 1972, inKladno, Czechoslovakia, and is known as a professional ice hockey player, who currently plays in the position of right wing in the National Hockey League (NHL) for the Florida Panthers. He is considered to be one of the most productive European-born players in the NHL, and one of the best ice hockey players in the whole world. His professional career has been active since 1990. Have you ever wondered how rich Jaromir Jagr is, as of early 2016? According to sources, it has been estimated that Jaromir’s net worth is over $40 million, which has been accumulated over the years through his career as a professional NHL player. Jaromir Jagr was raised in an Orthodox Christian family; the son of Jaromir Jagr, who is the president of HC Kladno, thus under the influence of his father, he began playing ice hockey, being introduced to ice skates when he was only three years old. Before Jaromir entered the 1990 NHL Entry Draft, he played for the hockey club HC Kladno in his home country. In the Draft, he was selected as the 5th overall pick by the Pittsburgh Penguins, and stayed with the team until 2001. During the 1990s, Jaromir became one of the best hockey players in the league, winning numerous individual titles, and team titles with the Penguins. In 1991 and 1992 the Pittsburgh Penguins won the Stanley Cup, and he was named into the NHL All-Rookie Team in 1991. He participated in eight NHL All-Star games while being a part of the Penguins, in 1992-94, and 1996,-2000, and he also won the Hart Memorial Trophy in 1999, and was two times receiver of the Lester B. Pearson Award in 1999, and 2000. In 2001, he signed a contract with the Washington Capitals worth $77 million over 7 years, which certainly increased his net worth by a large degree, however his game numbers started to decline, and as a result he was traded to the New York Rangers in 2004. He slowly started to regain his previous form, and by 2008 he had won several new awards, including another Lester B. Pearson Award in 2006. In 2008 he became an unrestricted free agent, as his contract expired, and New York Rangers didn’t want to extend it, and as a result, he signed a contract with the KHL team Avangard Omsk worth $10 million over two years, and extended his contract for the 2010-2011 season, which only increased further his net worth. In 2011 he returned to the NHL, as he signed a contract with the Philadelphia Flyers worth $3.3 million over one year, and the following year he spent playing for the Dallas Stars, with which he signed a contract worth $4.5 million over one year, but was then traded to the Boston Bruins. Before he was traded to the Florida Panthers in 2015, he played a season with the New Jersey Devils, and it was announced on the 5th May 2016 that Jaromir will receive a one year contract extension with the Panthers, which will increase further his net worth. He has also been recognized as one of the best Czech hockey players, winning several gold medals with the Czech Republic at such sports events as Winter Olympics in 1998 in Nagano, World Championships in Vienna in 2005, and Cologne in 2010, which also helped add to his net worth. During his career Jaromir has set numerous records, including the most career game-winning goals with 130, most career assists by a European-born player with 1,095, and most career points by a European-born player with 1,827. Furthermore he has set several franchise records for the Penguins and the Rangers, including most single-season points with 123, and most single-season power-play goals among many others. Speaking about his personal life, little is known in the media about Jaromir Jagr, as he keeps it private, however, according to sources he is currently single, and divides his time between the Czech Republic and the USA. 1 Traded by the New Jersey Devils to the Florida Panthers for a 2nd-round pick in the 2015 NHL Entry Draft, and a 3rd-round pick in 2016. [February 26, 2015]. 2 Oldest player in NHL history to score a hat trick (42 years, 322 days old). [January 3, 2015]. 3 Officials at the Pittsburgh Supercomputing Center have dubbed previous computers at the center "Jaromir" after Jagr, and "Mario" after former teammate Mario Lemieux. 4 (July 4, 2008) Signs with Avangard Omsk (Omsk, Russia), the team he played for during the 2004/2005 lockout, a day after parting ways with the New York Rangers. 5 (November 7, 2004) Avangard Omsk (Omsk, Russia) announced it has signed Jagr, who has played for his native HC Kladno since the start of the 04/05 NHL season, which has been almost completely lost due the lockout of the players by the owners. 7 (January 23, 2004) The Washington Capitals trade Jagr to the New York Rangers for Anson Carter. The Rangers will pay the remainder of Jagr's 2003-04 salary and the Capitals will pay between $4-4.5 million of Jagr's salary in each of the next four years, with the star agreeing to defer $1 million per year of his salary. 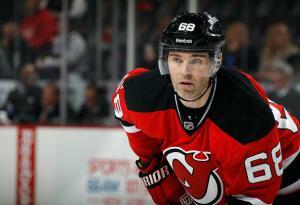 Jagr had 83 goals and 118 assists for 201 points in 190 games with the Capitals. 8 The Philadelphia Flyers announced Jagr has signed a one year, $3.3 million contract after Jagr's old team, the Pittsburgh Penguins, withdrew its one-year, $2 million offer. (1 July 2011). 9 Named to the World Cup roster for Team Czech Republic. 10 Name pronounced: "Yar-o-MEER ya-GER"
14 Endorses Jaromir Jagr Peanut Butter, sold in the Pittsburgh area. 15 Throughout his years in the States, he has lived with his mother because he loves her cooking. 16 Has an older sister, Jitka. 17 One of only five players to lead the NHL in scoring five times. 21 Honorary Chairman of Mother's Hope Foundation which aids sick and disadvantaged children. 22 His father, also named Jaromir, is the president of HC Poldi Kladno, Jaromir's former hockey club. 23 Wears #68 in memory of his grandfather who died during the 1968 Prague Spring uprising against the Soviet Union. 25 First Czech player chosen in a draft without defecting. 27 Salary for the 1999-2000 season: $10.4 million. 29 Has averaged 1.86 goals and 1.32 points per game during his career. 30 Known to his friends as "Puff Nuts"
31 Owns a sports bar in Prague (Czech Republic) called Jagr Bar.